FACT CHECK: Did Muslim Terrorists Bomb a Church in the Philippines "Yesterday," Killing 30 Christians? Some social media users started recirculating stories about terrorist attacks perpetrated by Muslim extremists in response to a deadly mass shooting in New Zealand by a suspected white supremacist. The media ignored the deaths of 30 Christians who were killed in a church bombing perpetrated by Muslim terrorists in March 2019. This attack occurred in January 2019 (not March 2019), 20 people died in the attack (not 30), and major news outlets reported on the incident. No bombing took place at a church in the Philippines “yesterday” relative to 14 March 2019. 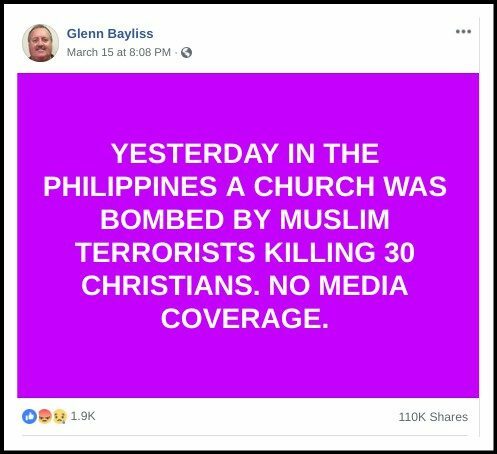 This Facebook post appeared to be referencing a terrorist attack on a church in the Philippines on 27 January 2019, left 20 people dead (not 30), and was reportedly carried out by ISIS. This Facebook message was likely shared with a purposefully erroneous temporal reference in an attempt to support the unfounded claim that “no media coverage” followed the incident. Of course, a number of major national U.S. news outlets, such as CNN, the New York Times, and the Associated Press provided coverage of this deadly attack. Two suspected improvised explosive devices detonated at intervals at the Jolo Catholic cathedral in the Mindanao region, according to the Autonomous Region of Muslim Mindanao. At least 81 people have been wounded, authorities said, including 14 soldiers of the Armed Forces of the Philippines and two Philippine National Police officers. ISIS claimed responsibility for the bombings via its Amaq News Agency. Shortly after the Amaq report, ISIS’ “East Asia Province” also issued a formal communique for the twin suicide bombings. ISIS did not provide evidence for its claim, nor can CNN independently verify it. This terrorist attack was also mentioned in a March 2019 follow-up report from the New York Times about the rise of ISIS in the Philippines. The Associated Press also mentioned this incident in an article about terrorist attacks at houses of worship in the days following the massacres at two mosque in Christchurch, New Zealand.